Tell us a little more about being a nerd at heart. Well, I'm a nerd. :) I love being alone with a good book, a stack of poems, or even a fashion dictionary. I actually like studying and learning new concepts, words, theories. I miss school! And I'm a goofball. My days are filled with silliness and tons and tons of laughter. How did you become involved with writing? It's something that I've always enjoyed. I started my own journal in elementary school and never stopped writing since. I majored in English and spent my entire college career dissecting literature, practicing writing techniques, and enjoying written 10-15 page assignments. Also, my grandpa has written a countless number of short stories, poetry and books. Maybe it's in my genes? He has encouraged me to write and to appreciate literature. There's something about writing a description that paints a picture in someone's mind or a quote that people want to share... It's just inspiring. How do you keep up with deadlines and a fast-paced environment? What are you most excited about for 2012? Any plans or resolutions? First and foremost, Ruche! My career is blooming right in front of me and I'm anxious to see what else I will learn, do, and create. This is my second family and I'm excited to grow with them. On another note, I'm excited to take one of my dream vacations in September. I haven't figured out all the details yet, but it includes Hawaii. :) When it comes to resolutions, I'm going to learn to cook, and make time to read more, and simply continue to be happy. It's a tie between Love Stories and Project DIY. All the posts in Project DIY never fail to impress me. There are so many creative people out there! As for the Love Stories series, anecdotes about best friends, fairytale romances, and strength are incredible, even if they don't all have "happy endings". The stories are little slices of life that we all can appreciate. So, who is your "wittle boogie woogie"? Boogie is my 10 months old Pekingese. He is one of 3 pets, but since he's still the baby, he's a bit spoiled. I also have a rescue pug/chihuahua mix named Linguine and a cat named Moo. 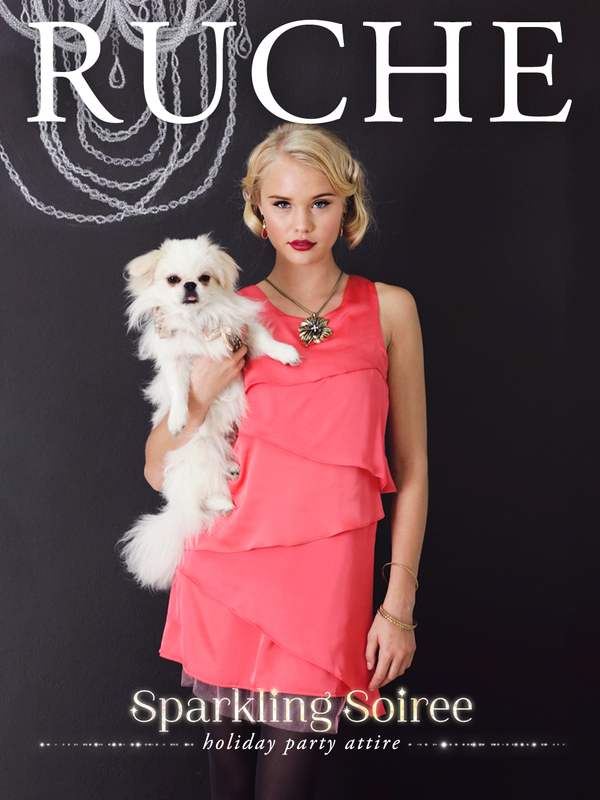 Fun fact: Boogie is on the cover of our Sparkling Soiree Lookbook. How did you enter the world of fashion marketing? I started a personal style blog, Late Afternoon, when I was still in school. When I moved out to SF after graduating college, I leveraged the popularity of my blog to get internships at various fashion companies. Because of my background in Social Psychology and Social Influence, marketing just seemed like a natural stepping stone to get into fashion. What do you consider to be the highlight of your job? I consider myself a very creative person, so being able to contribute my ideas and work on lookbooks has been really rewarding for me. I live in perpetual fashion daydreams, so seeing some of them come to life is literally a dream come true. This year I'm excited to get into a routine in Los Angeles. I've been back in LA for almost 10 month and it's been tough getting settled in. I can't wait to start feeling like LA is home again. I would also love to get another Pekingese, a girl this time, but I know that would be crazy. I love coming up with marketing ideas and programs that go beyond traditional advertising. I've worked on a lot of different programs, but my favorite is Shop With Us. It's a realistic interpretation of what our fashion buyers go through during a buying trip and it's such a cool way to shop. And as someone who is addicted to online shopping, I just love the idea of having the power to decide what a store should sell. 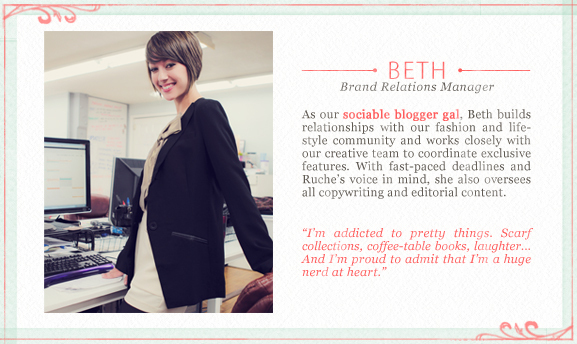 Meet a few more Ruche ladies here! 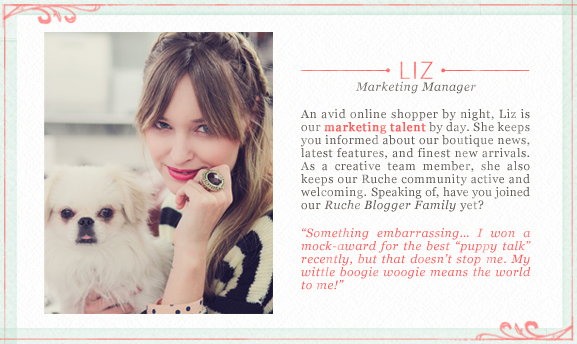 We also have a interviews with Ruche's Co-Founder, VP of Operations, Buyer/Stylist and Products Manager. Thanks for stopping by!